I love breakfast. Eggs benny, pancakes, omelettes, and waffles! 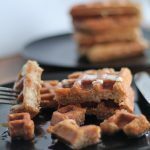 I may be addicted to these paleo waffles, with a texture like brown bread these paleo waffles would also be great as a sandwich! When you are doing a paleo challenge, or special diet, it can be hard to find things to do with friends. It's amazing how many of my social activities, especially in the winter, are focused around food. Luckily I have a love of cooking and the “worlds best roommate”. She loves to clean. I know, right? Jackpot. 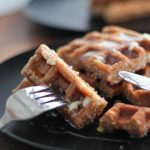 So while doing the 30 day paleo challenge I created these waffles for a breakfast-for-dinner girl-date. I feel I am a collector of remarkable people: from my “worlds best roommate”, friends from childhood, high school, co workers, friends- and family-of-friends, spouses-of-friends, and sometimes even complete strangers become fast-friends. As a result of the amazing-ness of my friends, I get: house keys, I have rooms in all sorts of homes all over the world, and I get to house-sit, babysit, or pet-sit fairly regularly. It's a big deal having someone trust you with their loved ones, homes and stuff. And it means I get to love kids and pets, and cook in all sorts of different kitchens. It's fantastic. I think it is an under-touted benefit of being single. Unfortunately I do things to excess. I spent 28 days in January away from home. It was great fun, but I am so glad to be home. Something about your own bed and shower, the familiar feel of your carpet on bare feet, and the smells and sights of your own stuff. Living out of a bag the majority of the last month has helped me reinforce that I have too much stuff! Time for some serious sorting and purging! 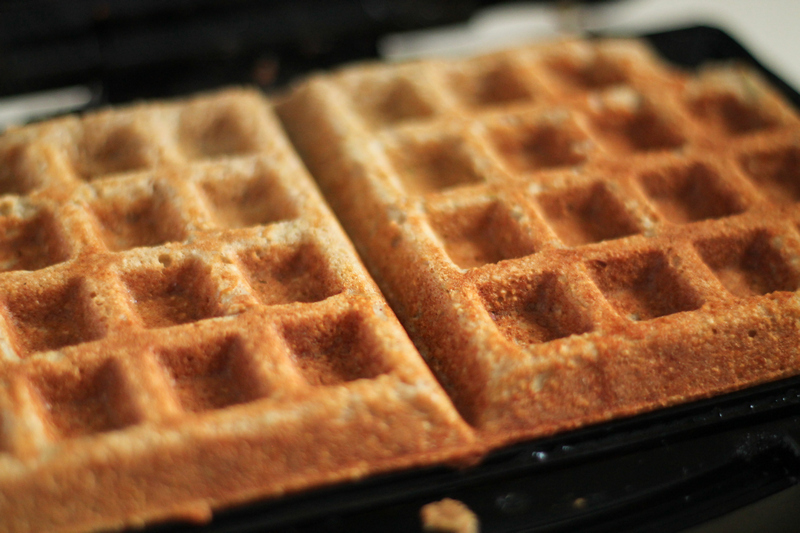 After some delicious paleo waffles of course. This is my first recipe using manioc flour. I really like it for gluten-free and paleo friendly flour. 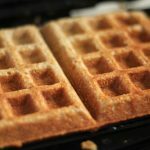 It can be substituted into recipes 1:1 for whole wheat flour and it gives a similar texture. It goes by many names: manioc, cassava or more finely ground as tapioca. You can learn more about it here. I found some accidentally at a local deli, jammed on a shelf with chestnut flour and pasta. I'm glad I did! 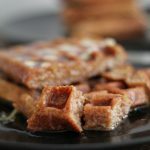 Paleo Waffles, grain and gluten-free, these paleo waffles have a texture similar to brown bread, great for sandwiches as well and breakfast or brunch! Combine: eggs, grated apple, manioc flour, almond meal, coconut milk and oil, stir well. Add: cinnamon, apple cider vinegar, salt, baking soda and water and again, stir well. 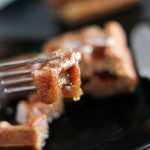 Spoon onto a hot and greased waffle iron. Cook for approximately 4 min. That’s amazing! 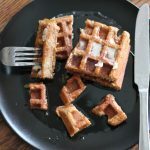 When you posted the instagram picture I was totally impressed, and then immediately envious because I wanted to also eat more waffles. Thanks for making them and sharing the photo!! Those look fantastic. 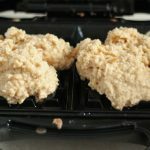 I know one of the things I look for in a gluten free flour (or mix) is something that will end up with a nice texture, as well as taste. 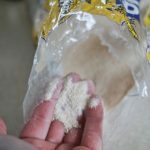 Looks like you manioc flour fits the bill! I haven’t tried this one yet. Texture is SO important, and trust me I tried many before landing on this one! Thanks for the comment! 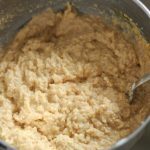 Can you use cassava flour instead of manioc flour? You probably could. Cassava, until recently has been hard to get in Canada. (Where I live). I believe it’s a different part of the same plant. Try it out and let me know how it goes! 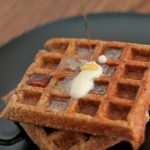 FANTASTIC WAFFLES! My batter was quite a bit runnier than the picture, perhaps because I cannot afford Cassava and used tapioca flour. However, they still turned out amazing! SO incredibly good! (As I am only grain free, and not Paleo, I did add one tablespoon of sugar). 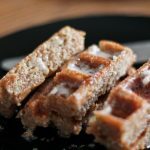 I am so glad this recipe worked without the cassava flour!